Good to eat and improve your soil, too! California is noted for its culture of many of the nation's foods. One that is relatively unique to our state is the fava bean (Vicia faba). Fava beans are also called Horse, Broad, Windsor, English Dwarf Bean, Tick, Pigeon, Bell, Haba, Feve and Silkworm beans. It is similar in size to the lima bean and is native to the Mediterranean region, especially Italy and Iran. It is one of the oldest cultivated plants known, with its culture extending back to prehistoric times. In North America, Canada is perhaps the largest producer of fava beans since they produce best in cool summer areas. Minnesota and the lake states produce small acreages. In California, fava beans are grown as seed crops along the coast from Lompoc to Salinas and in the Northern Sacramento Valley, but in other areas of the state they are grown mostly as a cover crop or for green manure. Fava beans are a relative of vetch, a determinate type with erect, coarse stems and large leaves without climbing tendrils. It grows to be a bushy plant, two to seven feet tall. The white or purplish flowers are born in clusters on short stalks in the axils of the leaves. The large-seeded varieties bear 1 or 2 pods at each node while the small-seeded types produce from 2-5 pods. The pods produced are up to 18 inches long and contain from 3-12 large beans. There are about 15 pods per stalk on the large types and 60 pods on plants of the small-seeded varieties. When stored under favorable conditions, most bean seeds have a life expectancy of 3 years. 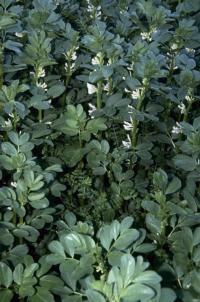 "This plant is used as livestock and poultry feed, for a cover crop, and as either a green or dry vegetable. It is also used as a coffee extender when roasted and ground. The dry beans are about 24% protein, 2% fat, and 50% carbohydrate, and have 700 calories per cup. The fava bean is a cool-season annual legume and is usually planted February and March in California for vegetable use and September to November for cover crops. When grown for seed production, the crop takes 4-5 months to mature, depending upon the planting date. Optimum growing temperatures are 70-80 degrees F. The plant is resistant to frost damage to at least 21 degrees F, but does not do well under summer heat of the interior valleys, especially during flower/pod set. The seeds should be planted about one to two inches deep (large varieties) into well prepared soil, three to five inches apart. Germination takes place in 7 to 14 days. Since they will grow into small bushes, the sprouted seeds should be thinned to 8 to l0 inches apart (this may not be practical), allowing two to three feet between rows for seed production. For cover crops, one plant per square foot is recommended. Plants do best on well drained heavy silt or clay loams but will also do well on adequately moistened sandy soils. Because they are of the legume family, fava beans do not need nitrogen fertilizer if the plants are properly nodulated. Select the pods when they are green, thick and have a glossy sheen. These should be well filled with large beans. The raw bean can then be kept in the refrigerator for a day or two. For preparation to cook, remove beans from the pods and then hull the beans. The hull is the thin outer coat (pericarp) around each seed. Beans can then be cooked in boiling salted water for 20-25 minutes in a covered saucepan. Savory herb also makes a good addition. Other methods of preparation similar to lima beans are satisfactory. Also, young, fresh fava beans can be cooked without hulling. Fava beans are reported to be susceptible to aphid and bean weevil attack. Some rotenone products are registered for weevil control on beans. Ladybird beetles and some small parasitic wasps can be effective in controlling aphids. Several products containing diazinon or malathion are registered for aphid control on beans. As with all pesticides, make sure the label specifies your intended uses, and follow the directions carefully. Little is known about diseases affecting fava beans under California conditions due to the limited acreage in production. One disease identified in the northern San Joaquin Valley area is Chocolate Spot, Botrytis fabae. This fungus disease causes brown spotting on leaves and pods and is favored under moist conditions. Severe attacks can cause leaf and pod loss. Several virus-like diseases and powdery mildew have been observed on fava beans, but were not positively identified as to the causal agents. Fava beans are a preferred host of black aphids and may serve as a bridging host for virus diseases that the aphid transmits to other leguminous species. Favism is an inherited disorder of certain individuals, particularly of southern European origin. These people have an enzyme deficiency expressed when fava beans are eaten, especially raw or partially cooked. Symptoms commonly include acute toxic hepatitis and those similar to influenza. Males are more commonly affected than females; mortality is almost entirely confined to children. Fava plant pollen in the respiratory tract also affects these people.